Do High Fevers Cause Brain Damage? Do Fevers Cause Brain Damage? It has long been believed that high fevers can cause brain damage, especially if left untreated. So how much truth is there to this claim? It really depends on the situation. Most fevers are caused by viral or bacterial infections, but they can also be caused by toxins, cancers or autoimmune diseases. A fever is just a symptom of illness, not an illness itself. When an otherwise healthy person has a fever because of an illness, it is extremely unlikely to cause brain damage. Even febrile seizures, which occur in children, do not cause any permanent damage. The time to be concerned about a high fever is when it is not caused by an illness, but because of overheating. This is actually heat stroke (hyperthermia), which is completely different than a fever. Hyperthermia can be caused by overexposure to high temperatures and under consumption of water. In these cases, the body may not be able to regulate its temperature, and medications will not bring the temperature down. Brain and organ damage usually occur because of hyperthermia. Even if you or your child have not been exposed to high temperatures, and hyperthermia is not a concern, there are several other factors that play into deciding what to do about a fever. Generally, treatment is going to be based on how the person is feeling and acting. Fevers are actually helpful when the body has an infection because they make it more difficult for germs to live and multiply. The fever is actually your body’s natural way of fighting off the illness. The purpose of treating a fever is just to make the person more comfortable, not to eliminate the fever completely. If an adult or child has a fever but feels okay, and is still able to perform daily activities or play, there is no reason to treat the fever. However, if the person is not feeling well enough to get out of bed or play, then it is fine to treat the fever with medication. Tylenol (acetaminophen): Tylenol is approved for use in children as young as 2 months old, but should never be given to a child under 3 months without first speaking to a doctor. Advil or Motrin (ibuprofen): Ibuprofen is approved for use in children as young as 6 months. Aspirin: Aspirin should never be given to children under 18 years of age, unless specifically recommended by a doctor, because of the risk of a rare but possibly fatal illness called Reye’s Syndrome. A lukewarm bath may be helpful, but should only be tried after medication has been given to prevent the temperature from rapidly rising after getting out of the water. If a bath makes your child uncomfortable or unhappy, it is unnecessary. If a child has a fever and does not feel better about an hour after taking acetaminophen or ibuprofen (regardless of whether or not the temperature goes down), call his healthcare provider. Do not bundle someone who has the chills and do not use cold baths or alcohol rubs. These can all raise the core temperature of the body, making the person feel worse, not better. Using alcohol all over the body to bring down a fever can cause alcohol poisoning. If the high temperature is caused by overheating, heat exhaustion or heat stroke, treatment is very different. Remove the person from the warm area. Place ice packs in the armpits, behind the neck, and in the groin area. Give cool fluids if the person is alert (never try to hydrate a person who is unconscious). If you are concerned that someone is overheated and they are unconscious, call 911 immediately. Seek medical attention, even if the person is awake. Do not give medications, they may not help and could even be harmful. 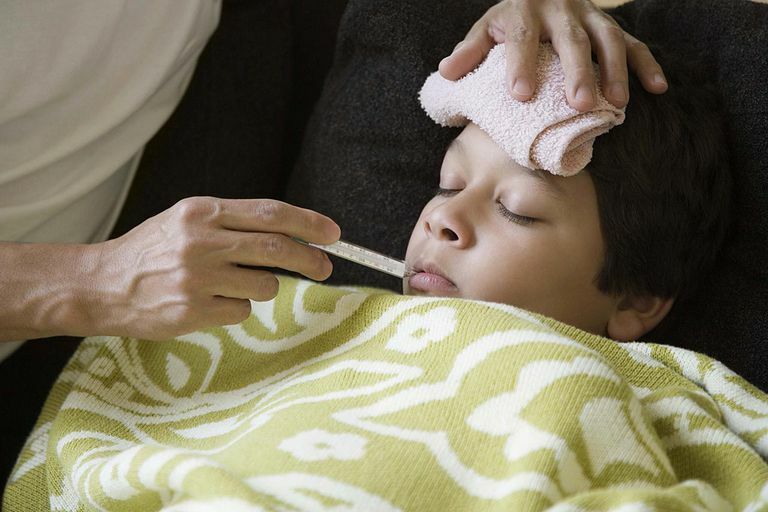 Fevers can be scary, especially for parents who just want their children to feel better. However, not every case of fever warrants worry. The only time the body will sustain damage due to a high temperature is when the body temperature goes over 107.6 degrees. Unless the fever is caused by an outside source (hyperthermia) or there is already a neurological problem, there is almost no chance that this will happen. ”Fever.” Medical Encyclopedia 20 Feb 08. Medline Plus National Institutes of Health. 12 Mar 08.